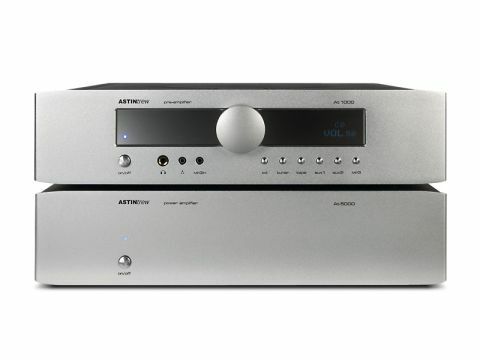 Astin Trew is a young company which we've watched develop with increasing admiration and it's new AT1000 pre-amp and AT5000 power-amp were very welcome pieces of review kit in the Hi-Fi Choice office. We'll come to the all-important sound performance in a few paragraphs, of course, but we would be remiss if we didn't praise the company for the highly professional look and finish of its amplifiers: these are really very smartly made units that, clichés aside, genuinely transcend their price tag. Most of the manufacturing process is carried out in China, but AT has done its homework and attended to all sorts of details. And the insides have hardly been skimped on, either. For a start, the AT5000 is a fully dual-mono power amp, right down to mains transformers – two hulking great toroids, each feeding a bank of smoothing capacitors after some low-noise Schottky rectifiers. The amplifying circuit uses a variety of devices, including a single valve per channel, small-signal transistors and a pair per channel of output MOSFETs, which are fixed to each side panel for heatsinking. Rated power is quite modest for the size. Over at the preamp, good-quality construction remains a theme. All components are through-hole types and again there are a couple of valves in evidence as well as a lone dual op-amp which, like the electronic volume control chip, sports a tiny heatsink. One minor annoyance concerns volume steps, which as so often are fine over the top (mostly useless) part of the range and coarser lower down. Six line inputs (including the front-mounted MP3 mini-jack) should cater to most users.